This walk begins at the Metro station Bastille. This station can be reached by metro lines #1, #5 and #8. The Metro station Bastille is a large, multi-tunneled station. No matter which line you arrive by, just take the first exit for getting up to street level. 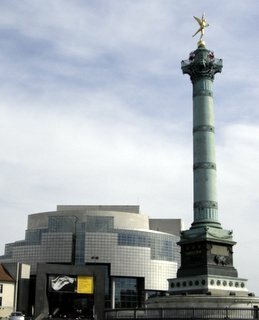 Once on the street, no matter which exit you use, you will see the Colonne de Juillet, the July Column, gracing the center of Place de la Bastille. The large curved and reflective building on the south side of the Place is the Opéra Bastille. The Place de la Bastille is the site where the prison named the Bastille once stood. The Bastille prison, originally a 14th century fortress, was razed soon after July 14, 1789, when it was stormed by a mob, marking the beginning of the French Revolution. All that is left of the building are a line of paving stones in front of the building addressed 5 Place de la Bastille. The Place de la Bastille is now one of the larger traffic circles in Paris and is often closed for political demonstrations and other events. The Colonne de Juillet (July Column), which graces the Place de la Bastille was created by d'Alavoine. It is made of bronze and stands 52 meters tall. 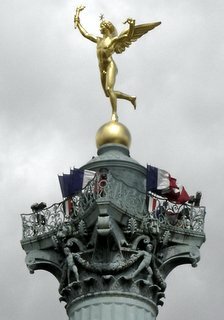 The top is adorned by a winged, gilded figurine representing the Spirit of Liberty called the "Génie de la Liberté". The Opéra Bastille was one of President Mitterand's "grand projects" and one of the most controversial, due, in no small part, to the financial expense of its construction. The Opéra Bastille was inaugurated by President Mitterrand on July 13, 1989, on the eve of the 200th anniversary of the "Storming of the Bastille". However, its inaugural performance wasn't until March 17, 1990, which was, "Les Troyens", by French composer, Berlioz. What you want to do now is find Boulevard Beaumarchais, which is opposite the Place from the Opéra Bastille. It is next to Avenue Richard Lenoir, which is distinguished by a wide, tree-lined parkway. This parkway on Avenue Richard Lenoir holds the largest of temporary outdoor markets in Paris every Thursday and Sunday between Place de la Bastille and rue St. Sabin from 7 a.m.-2:30 p.m. on Thursday and until 3 p.m. on Sunday. Boulevard Beaumarchias is the next street west from Avenue Richard Lenoir. Turn north on Boulevard Beaumarchais, going away from the Place. Walking on the left side of this boulevard, the second street you come to is Rue du Pas de la Mule. Turn left here (west). In a few steps you will notice the red-bricked buildings that make up the Place des Vosges. The Place des Vosges, built in the early 1600s, is a square composed of 36 houses with an arcade that runs the perimeter of the square. 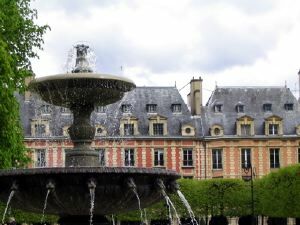 The Place des Vosges, originally called Place Royale, was given the name Place des Vosges in 1800, named in honor of the department, or county, which was the first department to pay national taxes. The park in the center of the Place des Vosges is called Square Louis XIII. Often, the grassy areas are available for use here. Other times there will be signs posted in the lawn saying, "Le pelouse au repos", which means, "The lawn is resting", which means, "keep off the grass". When you come to the Place des Vosges, turn left, in front of Square Louis XIII, and you will be walking down an arcade with columns and a vaulted ceiling. It will feel as if you've just entered the 17th century. Directly ahead, past the fine cafés and art galleries, at the corner of this arcade, is the house addressed 6 Place des Vosges, Maison de Victor Hugo, the house once lived in by Victor Hugo, from 1832-1848. It is now a museum. It is open everyday, except Mondays and holidays, from 10 a.m.-6 p.m., and admission is free. Continue walking the arcade to the next corner where there is a small, unassuming door on your left. Walk through here and you enter into the lovely 17th century courtyard of Hôtel de Sully. Often, photographic exhibts are offered here at Hôtel de Sully. The entrance to the exhibition room, called Jeu de Paume-Site Sully, is in the far right corner of this courtyard. Under the arch, across the courtyard, is the Hôtel de Sully bookstore which sells books about most anything having to do with France and French culture. Opposite the bookstore is the Center of National Monuments which manages over a hundred national monuments and publishes books on national heritage. This is the place for getting information, free maps and brochures on museums and monuments. By passing under these arches you will enter into another, though smaller, courtyard. This courtyard, which opens out onto Rue St. Antoine, was where the carriages were welcomed. 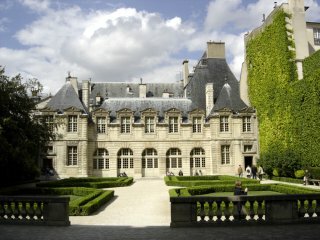 Return to the Place des Vosges by walking back through the courtyards of Hôtel de Sully. Retracing your steps here will not feel to be a waste of time. By walking straight through the door that led you into the courtyards, you will be able to continue your tour of Place des Vosges. When you get back to Rue du Pas de la Mule, turn left, and walk directly across Rue de Turenne. You will now be on Rue de Francs Bourgeois, which is just filled with small and very colorful clothing boutiques. 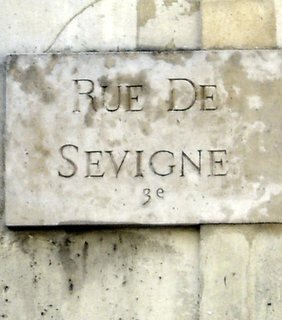 The next street you come to is Rue de Sévigné. Turn right here and immediately on your left is the Hôtel de Carnavalet and the entrance to the Musée Carnavalet, also called the Musée de l'Histoire de Paris. The museum is open 10 a.m.-6 p.m., Tuesday-Sunday. Admission is free. Even if you don't go into the museum, go into the courtyard. It is impressive, with it's 12 large sculpted figures in bas-relief high on the walls and a bronze statue of Louis XIV, standing in the center of the courtyard. Return to Rue de Francs Boureois and turn right. 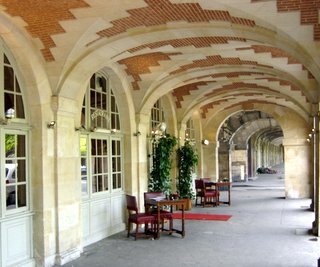 Very quickly is the arched entrance to the second courtyard of the Hôtel Carnavalet. It, too, is impressive, with its flower gardens and the statue of a winged goddess, offering laurel wreaths of honor. Across the street is the Hôtel d'Albret, built in 1550. It is now the home of the Direction of Cultural Affaires. Two streets after the Musée Carnavalet is Rue Elzévir. Turn right (north) here. In a few steps you will come upon the Hôtel de Donon, built in 1575, which houses the Musée Cognacq-Jay. This museum contains 18th century porcelain and furniture, paintings and sculptures from the collection of Ernest Cognacq. The museum is open 10 a.m.-5:40 p.m., Tuesday-Sunday, and the admission is free. Continuing down Rue Elzévir will bring you to the small Place de Thorigny. Continue straight through this Place, though, you will have to make a slight diagonal to do so. 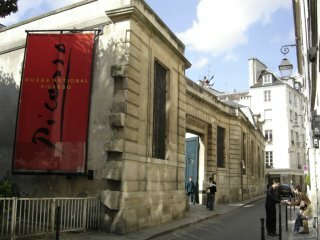 A few steps down Rue de Thorigny and you will arrive at the Musée Picasso. This building is the mid-17th century Hôtel Salé. This museum contains around 3,500 examples of Picasso's work, donated to France as payment of inheritance taxes. Retracing your steps back to the Place de Thorigny, turn right (west) at Rue de la Perle. The first street you come to is Rue Vielle du Temple. On the right (north) side of this intersection is the Jardin de l'Hôtel Salé. On the left (south) side is the Hôtel de Rohan. Here the street changes names to Rue des 4 Fils. The next street is Rue des Archives. On the right (north) side is the Musée de la Chasse et de la Nature, located in the Hôtel Génégaud, built during 1648-1651. On the left side is the Archives Nationale. Turn left here on Rue des Archives. 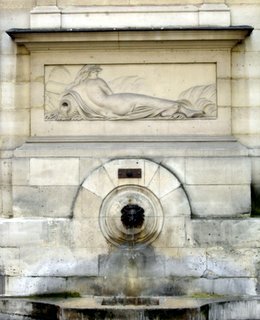 On the SW corner of Rue des 4 Fils and Rue des Archives is a very interesting drinking water fountain. It's as large as a small building. The spigot is a bronze lion's head. There is a push-lever above the spigot that you push and pull to turn on and off. The next intersection is Rue Rambuteau. Turn left here and immediately is the Hôtel de Soubise and the entrance to the National Archives, also called the Musée de l'Histoire de France. The courtyard here is something to see. The museum is open Monday-Friday (closed Tuesday) from 10 a.m.-5:30 p.m. (closed from 12:30-2) and on Saturday and Sunday it is open from 2 p.m.-5:30 p.m. and closed on holidays. Turning right on Rue Rambuteau will bring you to Rue du Temple. Here on the right (NW) corner is the Musée d'Art et Histoire de Judaïsm. It is housed in the Hôtel de St. Aignag, built during 1645-1650. The museum is open 11 a.m.-6 p.m., Monday-Friday and 10 a.m.-6 p.m. on Sunday. Admission is, for adults 6.80 euros, for 18-26 years old 4.50 euros, and for those under 18 years old it is free. Continuing down Rue Rambuteau brings you to the next street, Rue Beaubourg and to the Georges Pompidou Center, as well as the metro station Rambuteau, on metro line #11.